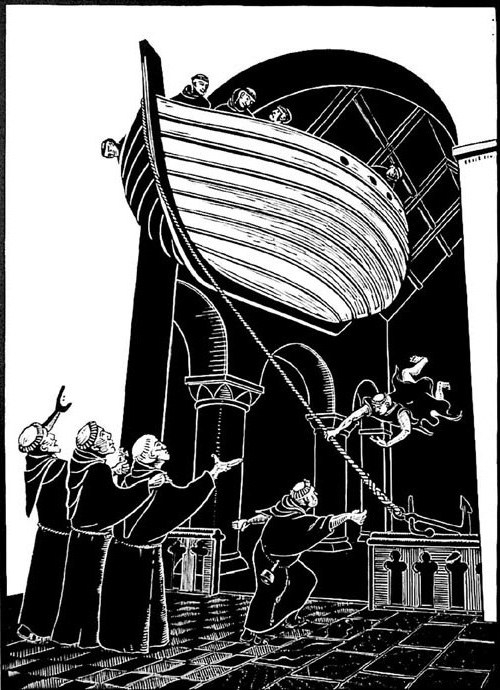 What with his practical printing, design skills and lifelong love of literature, it was a natural progression in his career as an artist to produce his own books. 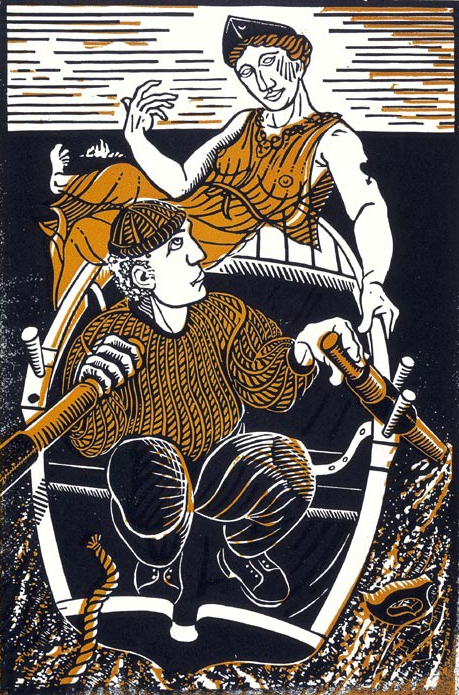 The success of Peter Grimes and the acquisition of a Jardine press, a small treadle platen press, led to a collaboration with poet Kevin Crossley-Holland in the production of the first Jardine Press publication The Wanderer. 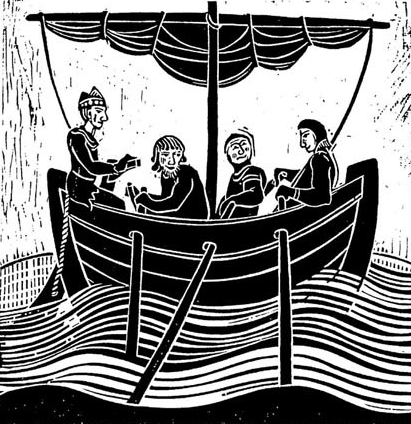 Crossley-Holland’s translation of the mournful Anglo-Saxon poem of exile is beautifully produced, containing eloquent and striking vinyl engravings, especially Helmsman by Dodds, which along with the hand set type, was hand printed by him on the actual Jardine press in 1986. 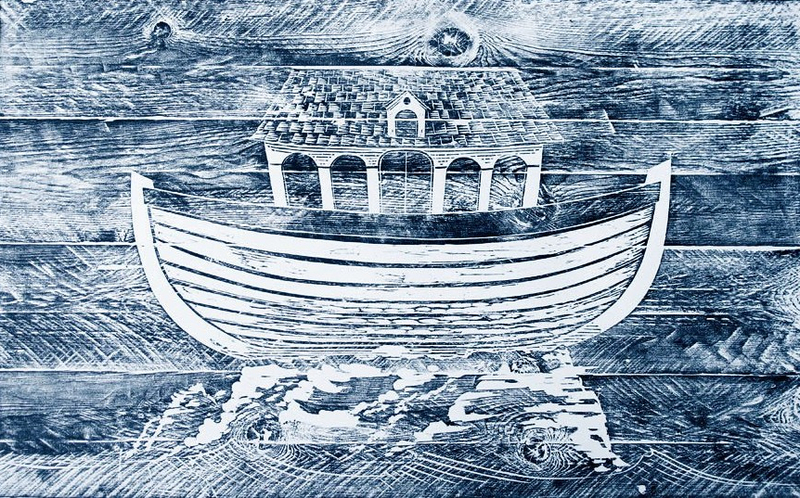 To celebrate the fiftieth anniversary of the production of Britten’s Peter Grimes, the Aldeburgh Festival commissioned a new opera from the composer Nicola LeFanu and Dodds’ former collaborator, librettist Kevin Crossley-Holland: The Wildman. This news was of immediate interest to Dodds as it was to be based on the Wild Man legend. Anything to do with nautical folklore, especially the Green Man, was dear to his heart and to cap it all, this was set in East Anglia. 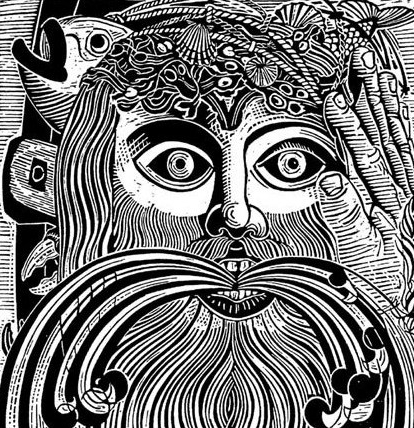 The story tells of a maritime green man caught in the fisherman’s nets at Orford, six miles down the Suffolk coast from Aldeburgh. He is imprisoned in the castle, horribly mistreated but fortunately escapes back into the sea. An early representation of the green man can be seen on the font in Orford church, a frequent venue for some of the Aldeburgh Festival events. 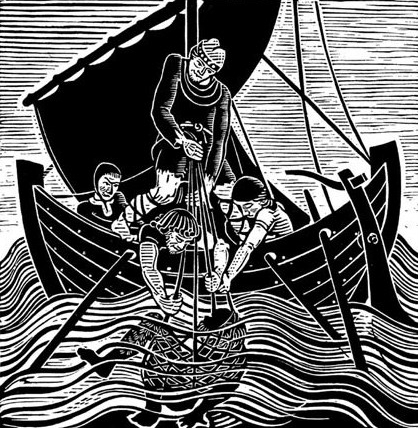 The tale has much in common with that of Peter Grimes, being the story of an outsider who “invokes fear and hostility in stout Suffolk Hearts”. This was an obvious must for a new publication for the Jardine Press. Dodds commissioned Allan Drummond to rewrite in verse the saga originally recorded in 1200 by Ralph of Coggeshall in the Chronicon Anglicanum. 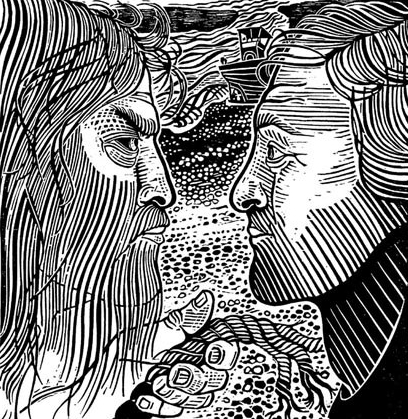 To illustrate Wild Man of Orford, Dodds created a series of nine woodcuts ~ an appropriate medium for such an ancient legend. 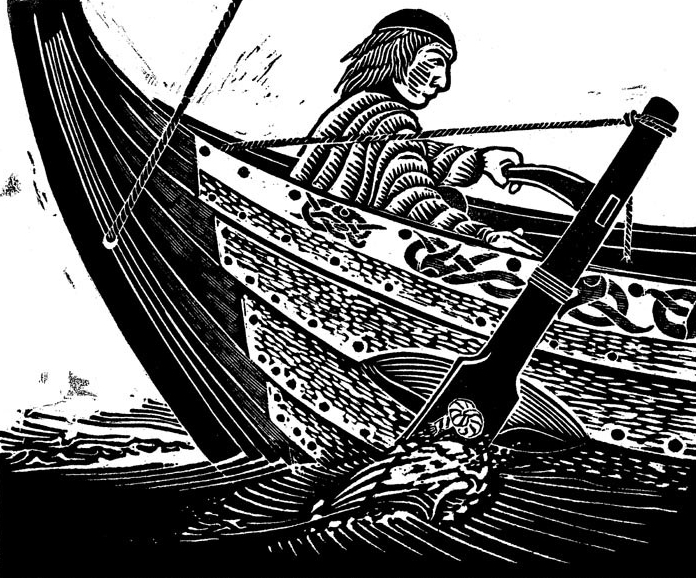 Using the rope motif as a symbol of an umbilical cord which ties us to our watery past, the woodcuts start with an almost mediaeval depiction of a boat Rowing and end with Face to Face with a modern fishing boat in the background. The Green Man from mediaeval times, with vines growing from his mouth, was translated into Wild Man Airborne, the vines becoming water. Later, yet another wild man surfaced; the huge Wild Man of the Sea (cut in cork) with his compelling and deeply penetrating gaze. The vines this time had been replaced by the fruits of the sea: water, seaweed whales and boats. This image was used on the cover of the second edition of The Wild Man of Orford in 2002. 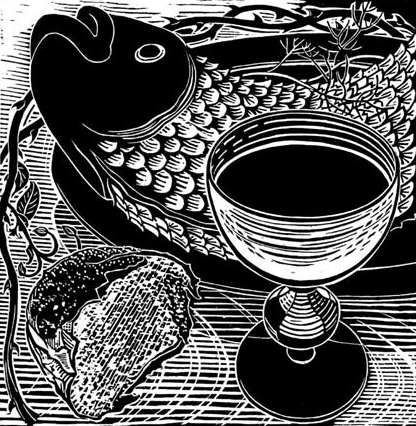 The Wild Man exhibition at Aldeburgh that summer was based on the book and the woodcuts. For hundreds of years the sinister ghostly dog, who came ashore with the Vikings, is said to have haunted the fens, churchyards and coastlands of East Anglia. Who better to write an epic poem following the phantom dog’s tracks than Martin Newell? 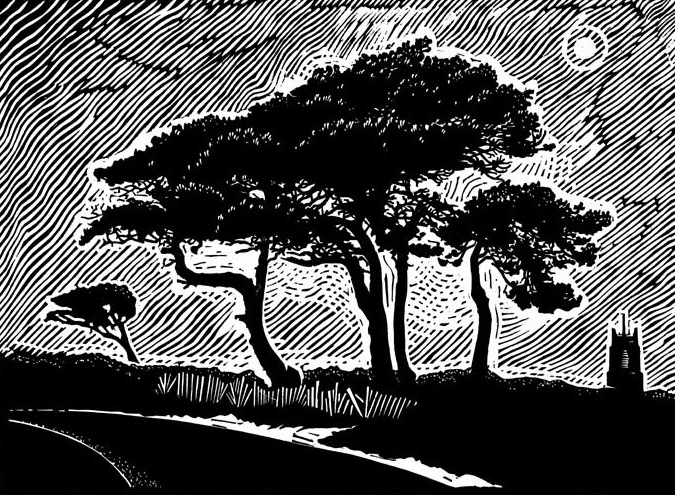 Dodds commissioned him to write it, while producing some appropriately foreboding linocuts to accompany the text, somewhat reminiscent of Edward Bawden’s Hound of the Baskervilles. 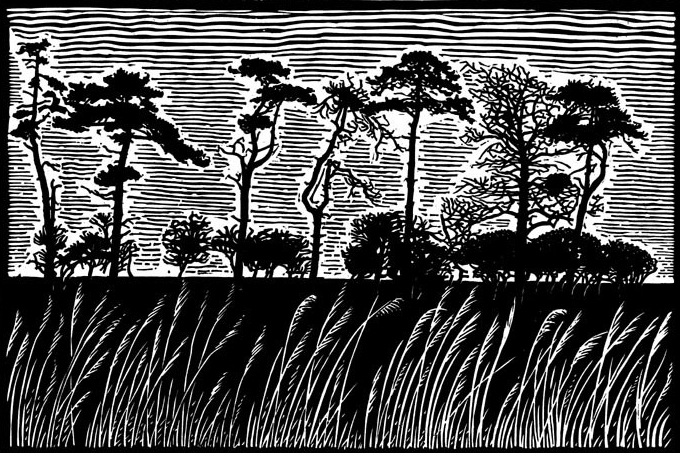 Although set on dry land with little opportunity for boats, the images Night Trees and Scots Pines once again demonstrate Dodds’ sensitivity to trees in the landscape. This story and the words by Heaney were later to inspire two powerful works by Jamie. 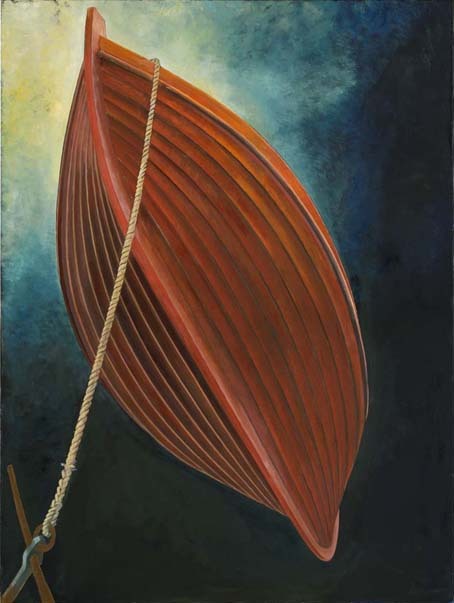 Not only did it reflect the connection he was making between his practical knowledge as a shipwright and his life’s work as an artist, but it appealed to his love of mythology.